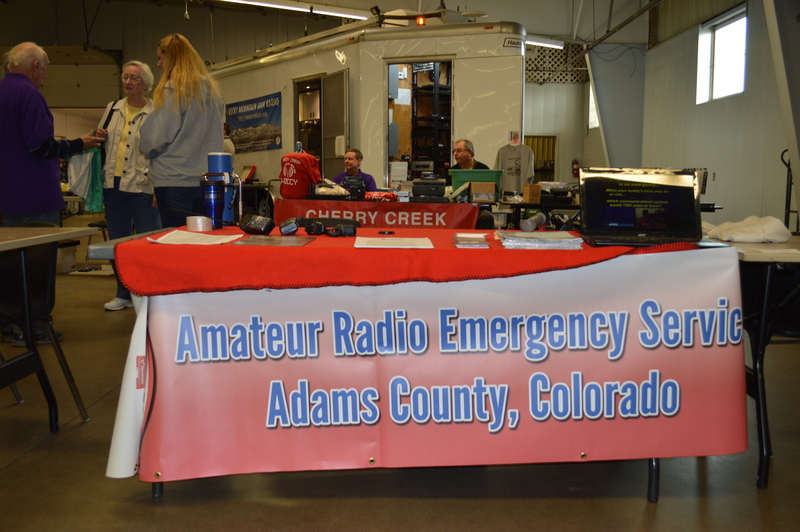 Our Public Information Officer (PIO), John Murphy, WN6OTL, was at the Aurora Repeater Association hamfest at the Adams County Fairgrounds on February 19, 2017 from 9 AM till 1 PM. We gave information out to people about the ARES program in general and about Adams County ARES (R1D1) specifically. 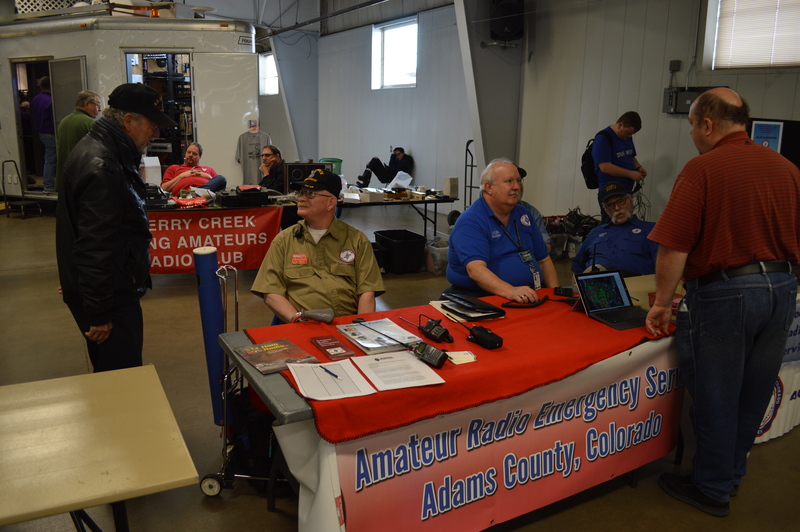 We were joined by Arapahoe County ARES (R1D2) and lots of information was shared both to the attendees that stopped be our tables as well as between both teams. Jeff Lindhorst, KC0LDR, stopped by and visited with a few of the ‘fest goers. We talked to 3 people who were interested in ARES (both with Adams County and Arapahoe County). It was a good day for all at the Aurora Repeater Association 2017 Hamfest. Thanks to Wayne, N0POH and the entire ARA for allowing us to come. Make a list of the items that you want included in your “Go Kit” showing each item and its location. This will help you to quickly collect all of the important items that are not normally stored in the “Go Kit” container. We will be having our annual business meeting on February 2nd at 7pm at the Adams County Sheriff Substation, Suite B, 4201 E 72nd Ave, Commerce City, CO 80022. Everyone is welcome to attend the meeting. We will be reviewing our COMPLAN and By-Laws. ♦ Start learning skills you need for when you’re on your own and it really counts. Academy’s only Master Fellow full time instructor, Carl Weil. mail $115 Class check to: Carl Weil, Director, 2477 CO. RD. Region 1 District 1 ARES participated in the full scale exercise hosted by Adams County and City of Brighton. On the morning of May 11th , 2016 at approximately 0800 hours, ADCOM911 receives reports of a train derailment, potentially affecting a chemical storage site at Agfinity, 124th and 85 (simulated location), resulting in an unknown number of injuries and release of an unknown substance. Brighton Fire is dispatched to Adams County Fairgrounds (area for field play designated for Incident Command Post) and confirms train car having made impact with the chemical storage site. Upon initial size up, the chemical storage tank affected contains Anhydrous Ammonia and the contents of the train car is Liquid Petroleum Gasoline. Current concerns will be any potential leaks and explosions. It is initially unclear what caused the accident. Upon further investigation the storage site appears to be leaking Anhydrous Ammonia, creating a toxic plume traveling at 10 mph with winds from the west. There are several homes in both the City of Brighton and unincorporated Adams County directly to the east of the facility. Evacuation notifications are sent and unified command is established. Fire and EMS will perform onsite triage of affected employees and incident casualties will be transferred to Plate Valley Medical Center for decontamination. Adams County and Brighton EOCs will activate to support the evacuation and any incident related needs, a Joint Information Center (JIC), City of Brighton Call Center and remote shelter will be established in support of the incident. R1D1 ARES was dispatched to five locations, the Adams County EOC, City of Brighton EOC, the Brighton Incident Command Vehicle, Thornton Shelter and the Platte Valley Hospital to provide a network of communications to all sites. The exercise lasted from 8:00 AM till 11:30 AM. There were 23 Agencies involved and 3 jurisdictions. While it was not perfect the knowledge gained and relationships built made it a great success. Norm Brown, KB1SGJ, R1D1 EC, invited others from R1D1 ARES to his house on Saturday, April 9th, to practice using digital messaging based on the RMS Express platform. John Murphy, KC0JPO; Eric Bettinger, KD0QCJ; Newell Besendorfer, W4PRG; Derek Jackson, KC0LCD; and Terry Young, N0VE all showed up with their equipment and set it up in Norm’s garage, using dummy loads as HF antennas. Everyone helped everyone to set up and get RMS Express working. As well, Norm had his home station set up and received messages from several in the group, passing ICS Forms, such as 214 and 205’s. Norm bought pizza for lunch, as we ate, we discussed what we had practiced and the possible uses that might be required by our ARES leadership. A good time playing radio, as well as in fellowship with fellow amateurs, was had by all.